A road trip is the perfect way to see the world, allowing you to explore a country (or continent) at your own pace and see areas that you may not normally have the chance to visit on a traditional holiday. We wondered, however, where is the best city in the world to road trip around? 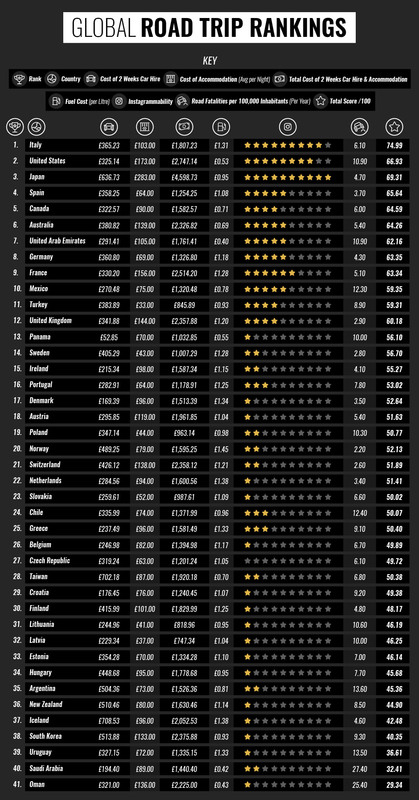 We’ve ranked the world’s more economically developed countries on factors including the cost of 2 weeks car rental and accommodation, the price of fuel, Instagrammability and road safety to reveal where you should consider taking your next road trip. When we take all of the studied factors into account, it’s Italy which comes out on top as the best country for a road trip, scoring particularly highly for its Instagrammability and road safety. From coastal fishing villages to snow-capped mountains and amazing lakes, Italy has a lot to offer to those road tripping around the country, so it’s no surprise to see it perform so well. Other countries which ranked highly include the USA (with famous road trips such as Route 66 and the Pacific Coast Highway) and Japan, which despite being among the more expensive countries, scored highly for road safety and even took the top spot for Instagrammability. 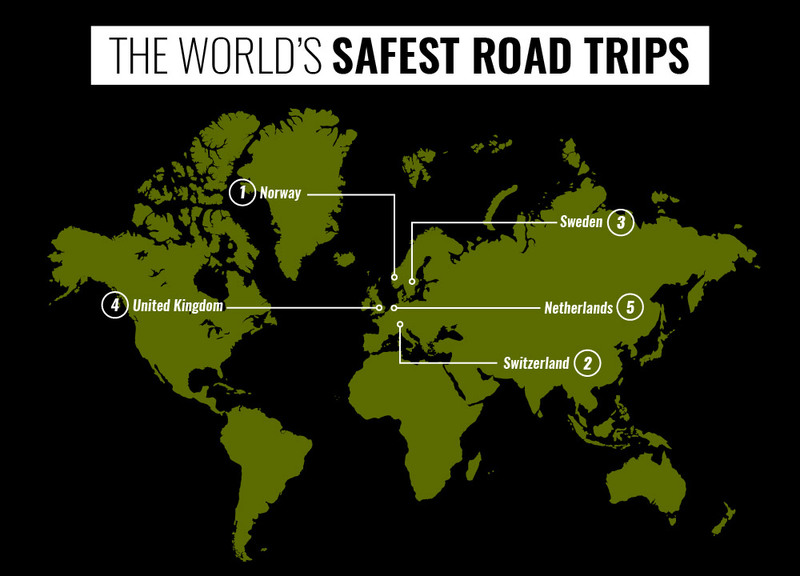 Wondering where your favourite country ranks on the road trip index? Below you’ll find the data for the world’s more economically developed countries. If you’re looking to road trip on a budget, where should you consider heading? Combining the costs of both car hire and accommodation for two weeks, all five of the cheapest countries to take a road trip were found in Europe, with Latvia coming out on top. Not only can Central and Eastern Europe be extremely affordable, but they’re also packed with gorgeous natural landscapes, magnificent architecture and rich histories. In fact, you could even take a road trip right through four of these five cheapest countries, starting in Latvia, crossing into Lithuania before going all the way through Poland and finishing up in Slovakia. How perfect does that sound? While it’s good to head off the beaten track once in a while, when you’re travelling abroad it’s good to know that the roads are safe and well-maintained. With this in mind, one of the key factors which we studied was road safety. Thankfully, the countries with the lowest casualty rates in the world also happen to be some of the most beautiful, including Norway, Sweden, Switzerland and the Netherlands. The question is; where will you take your next road trip? Hi I'm Jon, I'm the Digital Campaign Manager at Veygo. I passed my test over 15 years ago. These days most of my time spent in the car involves a sing a long to Disney's hits thanks to my daughter, but I do still enjoy road trips with friends when I get the chance!